The view from the Harrison-Dever crib this morning. 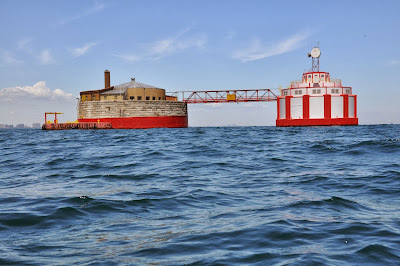 We always check our favorite Lake Michigan meteorological observation station -- the thermometer, anemometer and webcam located atop Chicago's Harrison-Dever crib two-and-a-half nautical miles offshore. 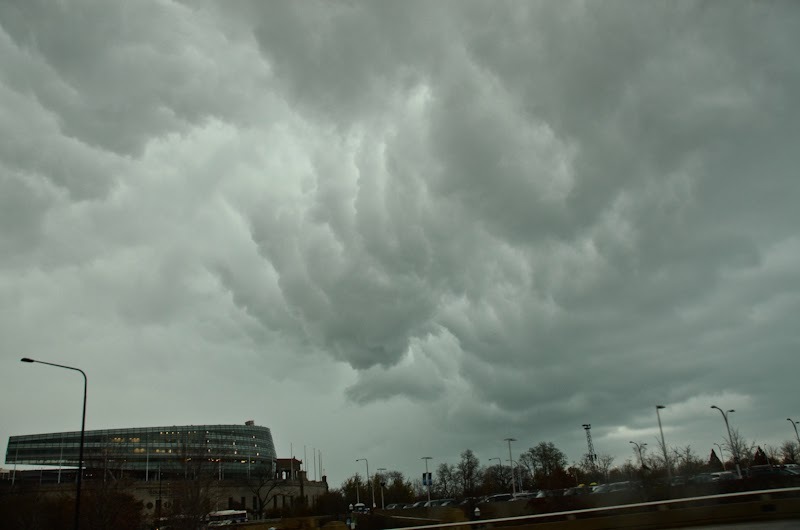 This NOAA Great Lakes Environmental Research Laboratory station, with its unimpeded view, is the best source of accurate wind data for the Chicago shoreline. 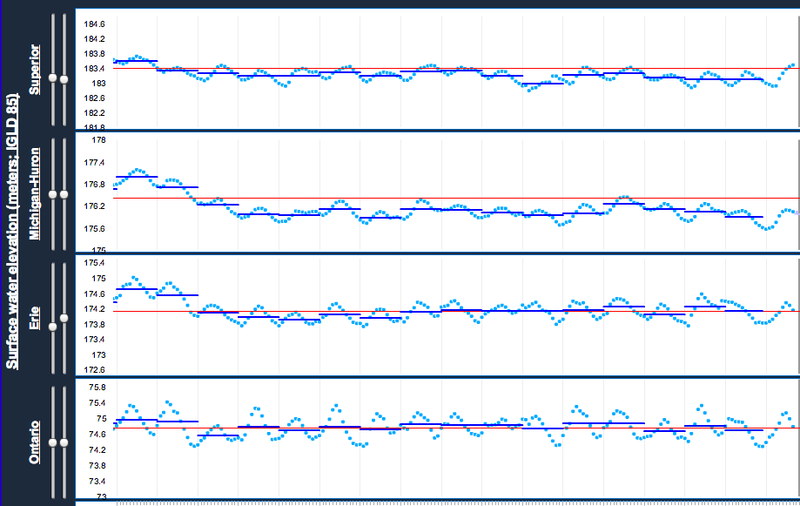 Sample data from the Harrison-Dever crib. 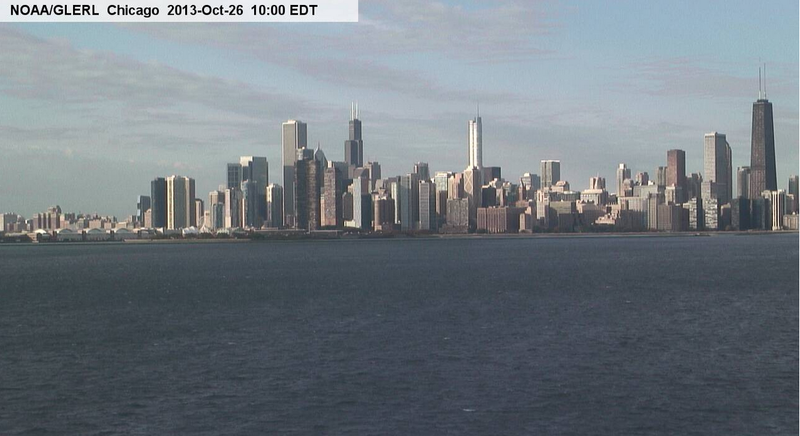 We've never had much use for the webcam, however, which is too far above the water to provide any sense of wave height. Until now. This morning, when we checked the site, we discovered a new feature: A six-hour time-lapse of webcam images, taken every 10 minutes. They still flatten out the waves, but you can see boats go by, watch the light change, and admire reflections on the skyscrapers in the background. It's really quite beautiful. Seriously, we're fortunate to have this service. The Great Lakes Environmental Research Laboratory has been instrumental in researching algae blooms and invasive species, collecting and forecasting water levels, and providing coastal forecasts and satellite images, among other environmental research activities. 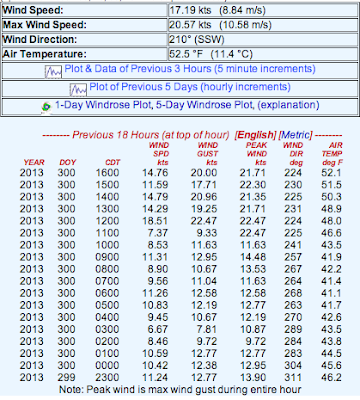 A portion of the Great Lakes Water Level Observations. We rely on the data from the crib for an accurate sense of wind speed and direction. 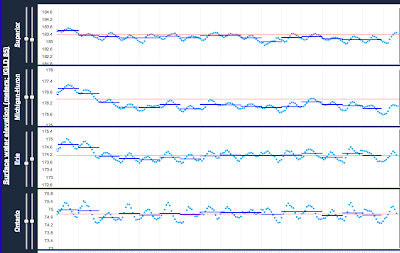 We also check it after we paddle to help us calibrate our internal anemometers. Thanks, GLERL. Another great service of the federal government! 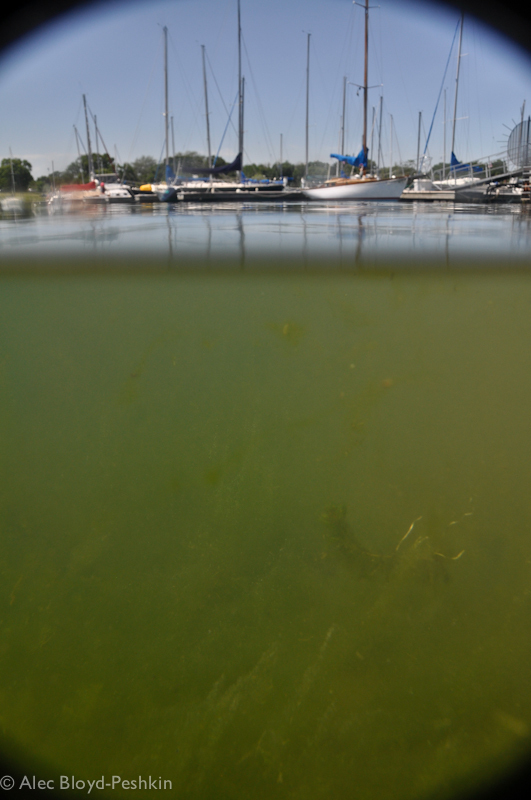 A "fresh breeze" of 17 - 21 kts (18 - 24 mph) is revealed in the water texture. 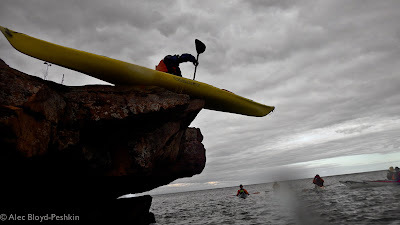 The irony of paddlesports is this: The more we paddle, the less time we have to write about it. 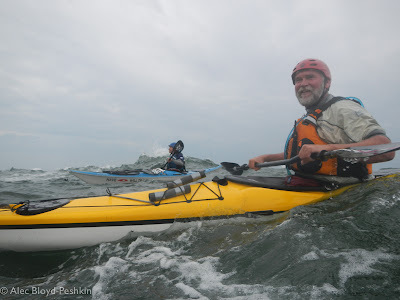 This has been a particularly busy time, between the courses we've been coaching, events we've been organizing, paddling for pleasure, and the training we've been doing. Hence the radio silence on our blog. Steve Macdonald, holding the fate of a very small canoeist in this hands. 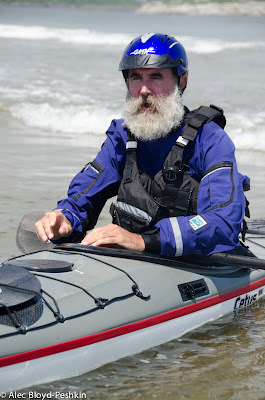 The center of our attention for the past two weeks has been Steve Macdonald, BCU Level 5 canoe and whitewater kayak coach from Scotland, who was here to run a series of BCU trainings and assessments that Summit Sports and Have Kayaks, Will Travel co-sponsored. 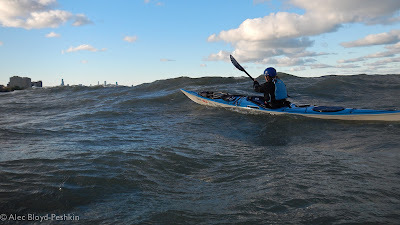 This intensive period was followed by The Gales Storm Gathering, co-sponsored by Go Kayak Now, Summit and us. We'll spend the next few posts catching up on all of this. This first post covers the 3* open canoe training and assessment we did with Steve. 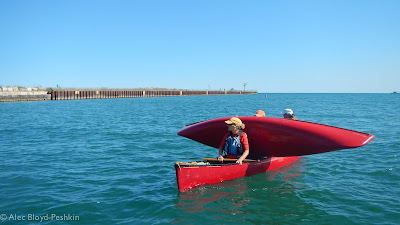 To be honest, we've invested most of our paddlesports energy in kayaks, so while we have worked on our canoeing skills and gotten out for some trips, an immersion in canoeing has been long overdue. And that's just what we got. 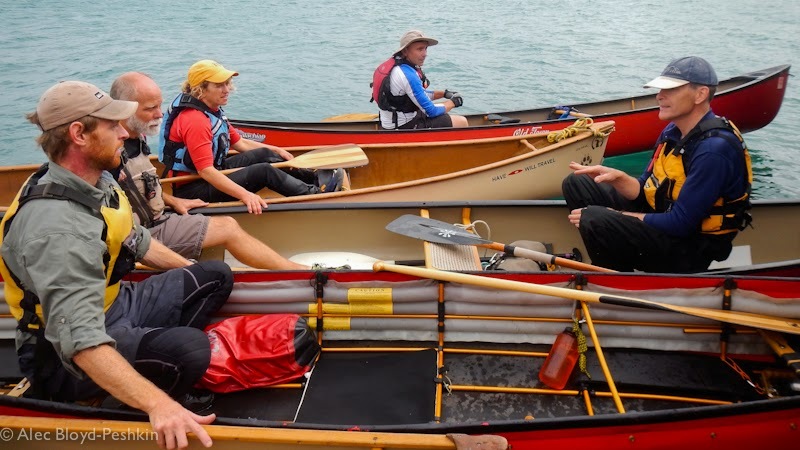 For two days, we worked on being efficient and effective in single-bladed craft. 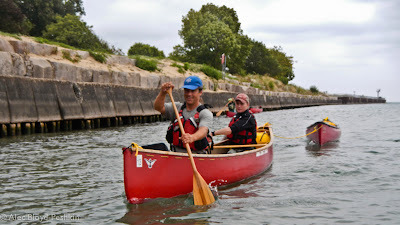 Steve compares paddling a canoe to moving a barge with a matchstick. It's not inherently easy, so efficiency is of the essence. If it feels hard, he says, change what you're doing to minimize your effort. Sailing with the aid of an additional canoe. 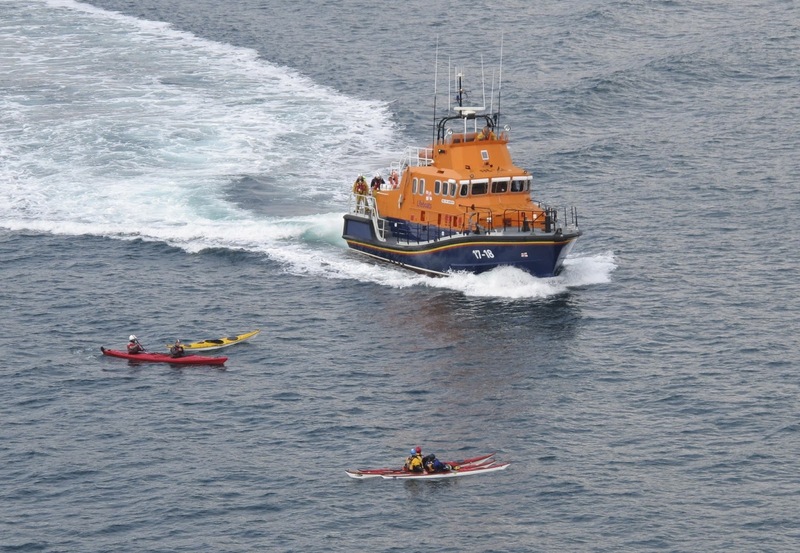 We spent time working on propulsion and steering, poling and rescues. 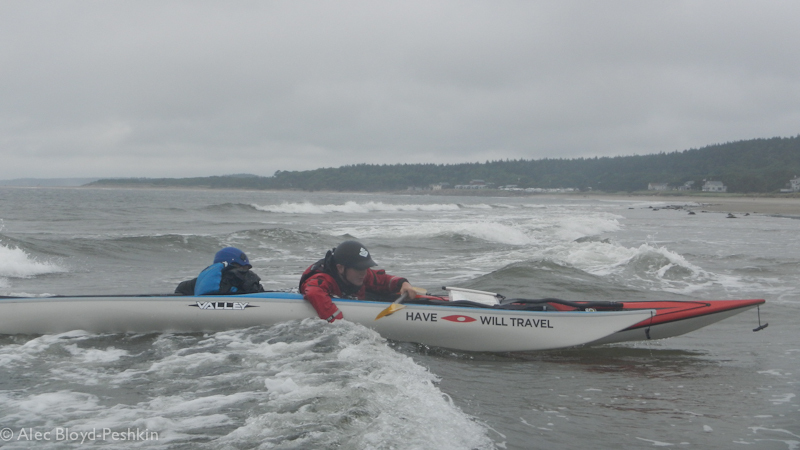 We explored the effects of tilt and trim, and we paddled both tandem and solo. We came to appreciate a core concept for the 3-star canoeist: the fine balance between propulsion and steering in a forward J-stroke. Steering around a buoy during the three-star training. 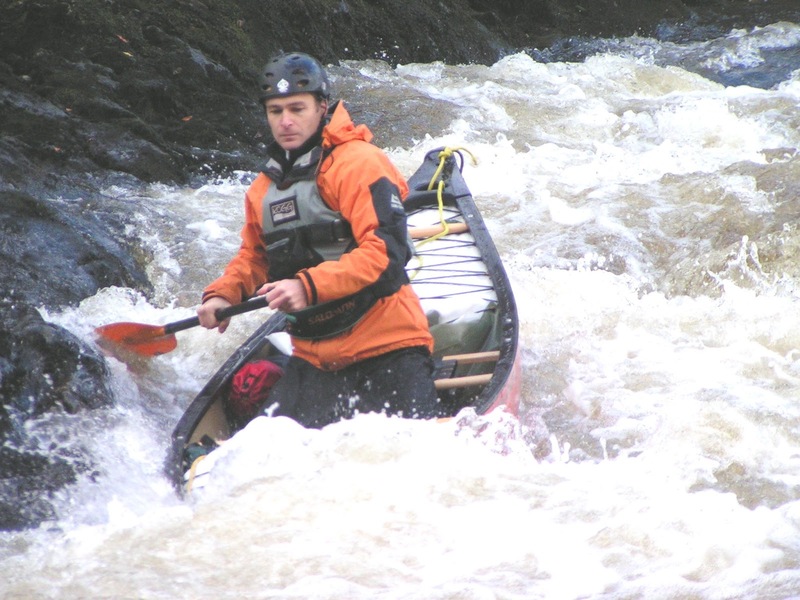 Poling, a shallow-water technique particularly useful on rivers. 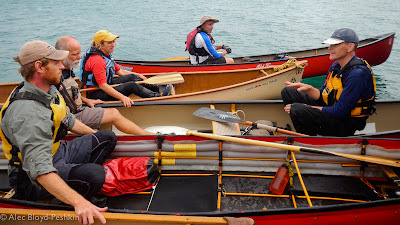 While we worked on specific skills, we also gained an understanding of the BCU canoeing philosophy, which is to use one general-purpose canoe with a variety of techniques and in a variety of environments and conditions. This surprised us at first, but we came to enjoy just how much we could really do with that one canoe. And all the while, we observed and appreciated Steve's coaching techniques--a seamless integration of so many of the approaches we've been studying and practicing. 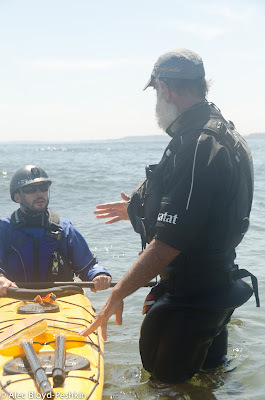 Receiving feedback from Steve Macdonald. 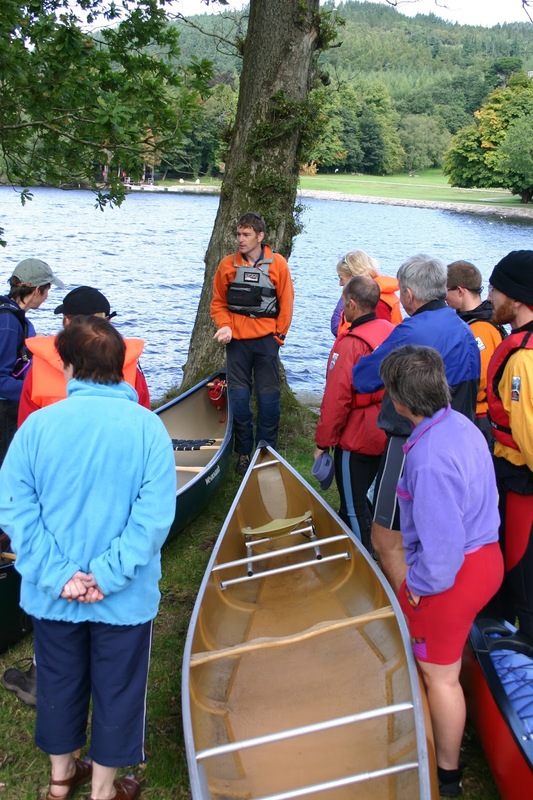 There's no doubt that what we learned about canoeing is hugely beneficial for our kayaking, too, as well as our coaching. It's all paddlesports; it's all about how we use our bodies, boats and blades to achieve the desired action in the water. Or, as Steve says, "It's all messing about in boats, as far as I'm concerned." 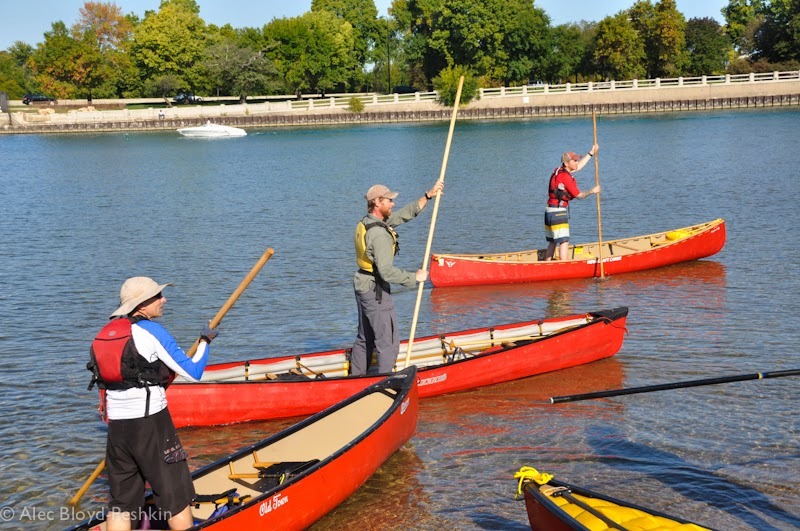 Congratulations to the Midwest's newest canoe three-star paddlers: Wendy Madgwick, David Yanowski, Chuck Stark, Pat Rota, and Sharon and Alec Bloyd-Peshkin. Well done! We're eagerly anticipating the arrival of Steve Macdonald, a BCU Level 5 Coach from Scotland who is a technical adviser to outdoor centers in the UK and is also certified in telemark and Nordic skiing as well as mountaineering. Steve is one of the featured coaches at the upcoming Gales Storm Gathering in the Apostle Islands. He will also be offering a number of BCU courses in the Chicago area, which are co-sponsored by Have Kayaks, Will Travel and Summit Sports, during the week before that event. One of these is the three-hour Coaching the Mind module, which will be offered on Wednesday, Oct. 2 in the evening in Oak Park. We talked with Steve about this course, which is being offered for the first time in the midwest. Have Kayaks, Will Travel: What excites you about this module? Steve Macdonald: The fact that it allows coaches to understand a bit more of the psychology that their clients might be experiencing. 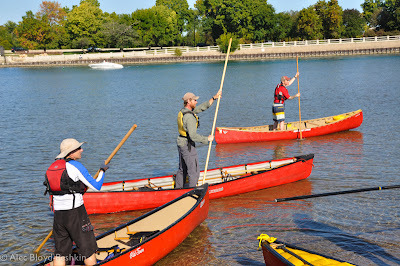 This can help them get the best out of a coaching episode and, more importantly, their ongoing paddlesport development. Mental skills are very fundamental. People have confidence issues, anxiety issues and all of that stuff, so it’s very relevant. HKWT: What do you find participants gain from it? SM: I think it broadens people's coaching, moving it away from just thinking of coaching only in terms of technical skills. You're familiar with TTPP, right? Generally, recreational coaches are focused on techniques and tactics, and [this module] helps make them more holistic coaches. HKWT: Will it also be applicable to people who teach or coach things other than paddlesports, such as gym teachers, soccer coaches and ski instructors? SM: Absolutely. We’ll look at how mental skills training is going to help in a training context, in a performance context and even in a competitive context. Some of the key things that we’re going to be focusing on are imagery, concentration and attentional focus. We'll look at how to manage anxiety and deal with confidence issues, making sure people aren’t overstimulated by the environment. It’s all about preparing people to be doing something in an environment when that environment might be stressful. There’s lots of sideways, tangential applications. Steve coaching a group of students in Ireland. HKWT: Will this be primarily lecture, or will there be other activities as well? SM: It should be interactive. There will be information at the front, but then we'll go out and workshop some of the strategies we’ve been talking about. There's no point in doing it unless we're doing it, you know? 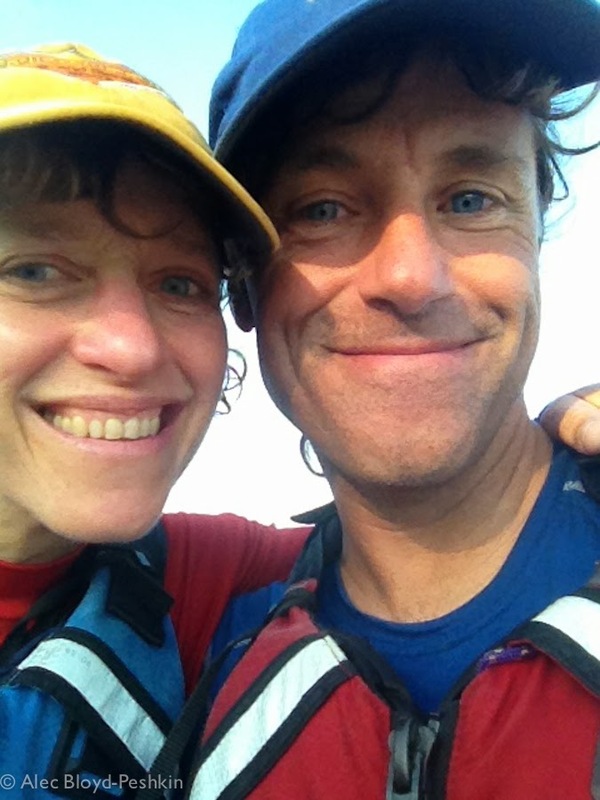 We're paddlesport coaches; we understand that learning has to take place in a practical context. The games, activities and exercises we do will be to reinforce the theoretical stuff we've been discussing. You: This sounds great! Can I attend? HKWT: Yes. The cost is just $35 and you can register online here. We should know the exact location of this module within the week. If you have questions, post them as comments here or contact us at kayak.bp (at) gmail (dot) com. Up until now, most of the photos we took on the water in dynamic conditions were shot with small waterproof cameras like the Nikon coolpix aw110. It's a very good camera, but it simply doesn't provide the features and photo quality of the the DSLRs we use on land (and, occasionally, on the water in calmer conditions). 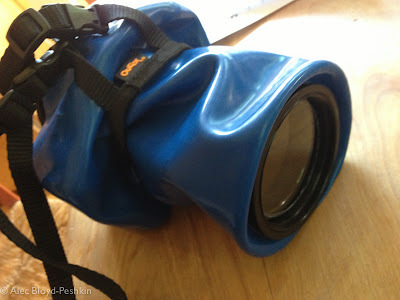 Early this summer we learned about a new product that allows us to use our DSLR on the water without worrying about it or the lenses getting damp. The Outex system is modular, making additions or replacements easy. The Outex system is comprised of a soft latex camera cover, optical glass lens, and a viewfinder or LCD screen lens. 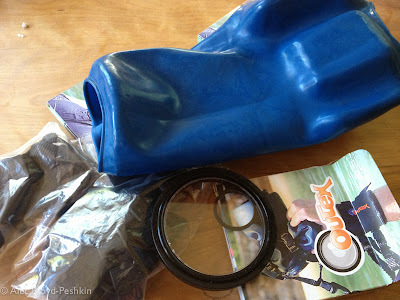 The camera cover is sized to fit specific cameras and a range of lenses. You then choose an Outex optical lens that fits the diameter of your lens and screws into the filter threads. 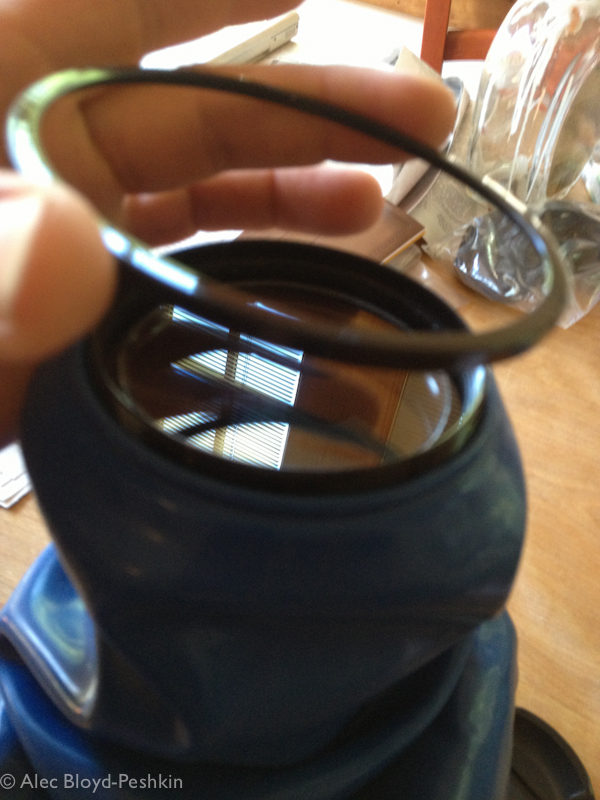 The latex cover fits over this and is sandwiched by a washer and threaded ring that fit over the optical lens. Putting on the washer that seals the cover around the lens. At the back of the camera, you can choose a simple viewfinder lens or the larger lens that allows you to see the viewfinder and LCD screen. We choose the later to enable us to shoot video as well as review photos on the spot. Either way, this cover slips onto your existing eyepiece and seals in the same manner as the front cover. The LCD cover allows a good view of camera functions. The final step of assembly is to install a strap to hold onto the camera. Outex offers a neck strap and a wrist strap. We choose the wrist strap because it's impractical to paddle with a full-size DSLR hanging over your PFD. Fully assemble, with an 18-200 mm. zoom lens. That's it! The brilliance of this system is that it isn't bulky, heavy or expensive like a traditional hard housing. You can operate camera controls easily through the flexible latex (though you can't see them, so you will have to do so by memory). So how does it work? Auto focus works most of the time with the cover on (though it sometimes has a hard time in lower light without the auto focus light). Because of the depth of the lens ring, there is some vignetting when using wide angle lenses. On our Nikon D90, the big LCD lens on the back of the camera can make it difficult to operate all of the controls on the back of the camera. The wrist strap system is very comfortable and secure. We wish the strap was a bit longer; 12 more inches would make a normal forward stroke easier with the camera at the ready in your lap. 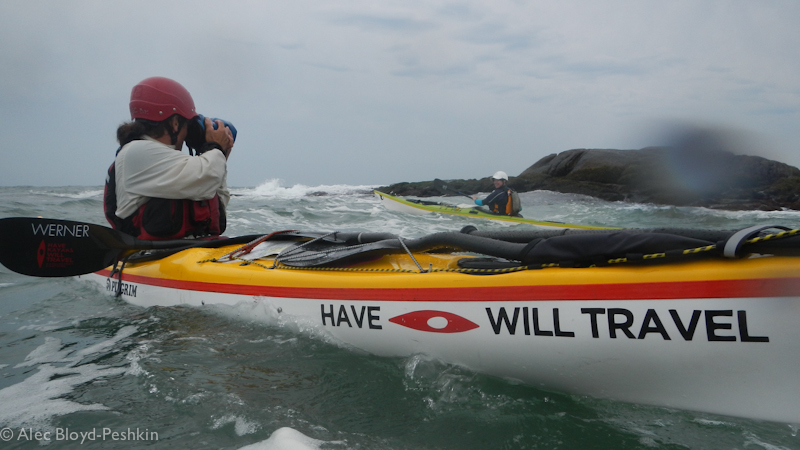 Practice capsizing with this system if you are going to be using it on the water. 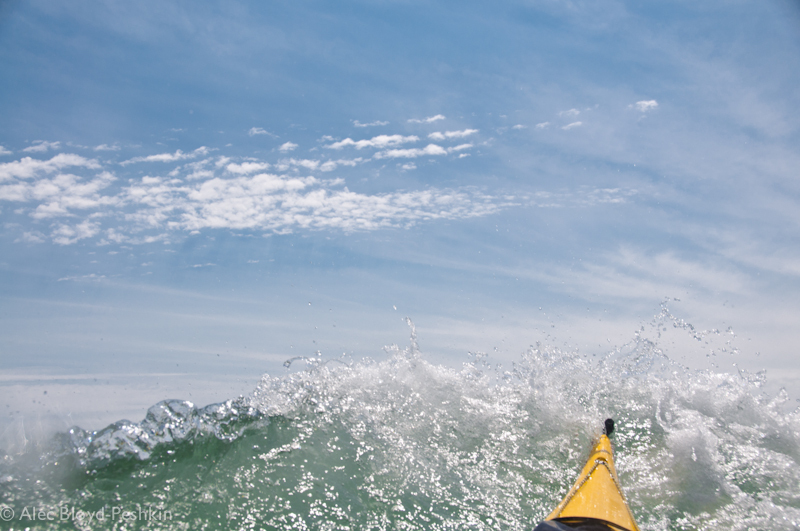 Rolling worked fine for us, but your camera and lens may get knocked against your boat. 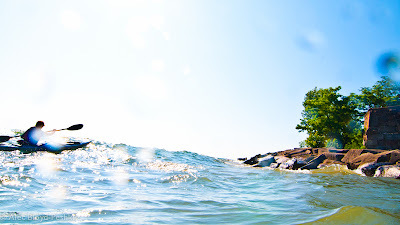 Depending on your comfort and balance, this system is great in rough water. But unlike point and shoot cameras, a DSLR requires both hands and is heavy, and if you use a zoom lens or telephoto lens it can throw off your balance (due to a loss of depth perception). For these reasons, it won't completely replace our small, one-hand-operation waterproof cameras. The whole system is modular. This means that if you puncture a cover or change cameras, all you have to buy is a new latex cover. The Outex website has a very friendly shopping system that will help you to choose the right parts for the camera and lens your have. How much does it cost? 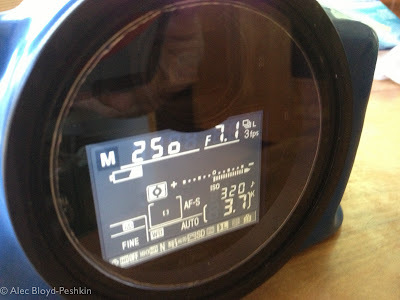 Depending on the options you choose, the basic setup for a Nikon D-90 runs about $330. A waterproof cover expands the angles you can shoot from. Overall we are very happy with what the Outex system does for us. 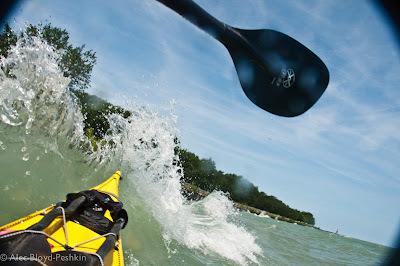 It does take some practice, but it allows you to bring the image quality and shooting options of a DSLR on to the water. Warm weather, warm water, nice conditions....it must be fall. A rescue scenario in Sea Kayak with Gordon Brown, volume 3. If you're jealous of the paddling opportunities and access in Scotland, Sea Kayak with Gordon Brown, volume 3 will only exacerbate that emotion. This two-and-a-half-hour DVD begins with "Handling Emergency Situations," which involves staged rescues by HM Coastguard helicopter and Royal National Lifeboat Institution boats. Why can't we do that? 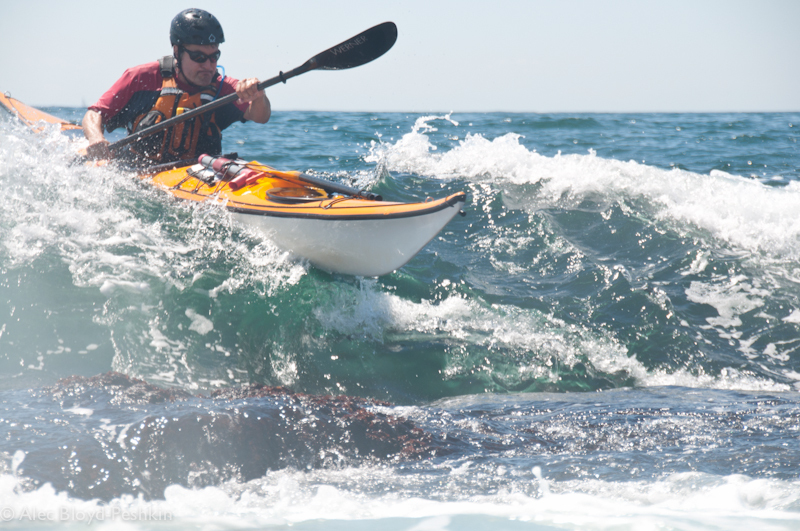 The scenarios aren't extreme; they're quite realistic examples of situations that start out small and grow to be life threatening, such as losing a paddle. They also aren't entirely simulated; Gordon and friends actually do get cold and suffer bruising from parachute flares. Best of all, they answer questions about the effectiveness of various types of emergency equipment we all carry but few of us ever get to use. This dramatic, 46-minute segment includes everything from initiating a distress call to attracting the attention of rescuers to preparing for the downdraft of a helicopter--all the things you need to know to facilitate a smooth rescue. It also takes a realistic look at how well flares, strobes and other signaling devices work in rough seas, shows us the operation center where calls are received and rescues are coordinated, and discusses what can be learned from the deliberate mistakes Gordon and friends make in these scenarios. Did we mention being jealous? At the end of "Handling Emergency Situations," we realized that Andy was Andy Stamp, BCU Level 5 sea kayak coach. And he is just one of many denizens of our paddling bookshelf and CD rack who appear in this DVD. The 47-minute "Navigation" section features Franco Ferrero, whose friendly book on navigation helped us gain basic competence without getting overwhelmed by the "dark art" of finding your way. Ferrero's approach is keeping it simple, and his explanations of tides, bearings, charts and transits are accessible and practical. 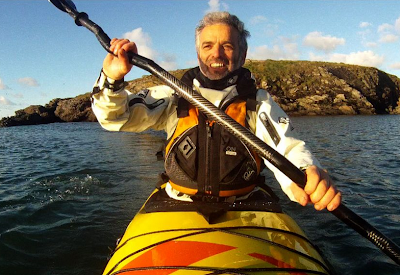 Franco Ferrero is one of several members of the paddling pantheon in this video. And then there's Rowland Woollven of Wilderness Emergency Medical Services Institute, who presents the 20-minute section on "First Aid Kits" (which includes handling medical emergencies). 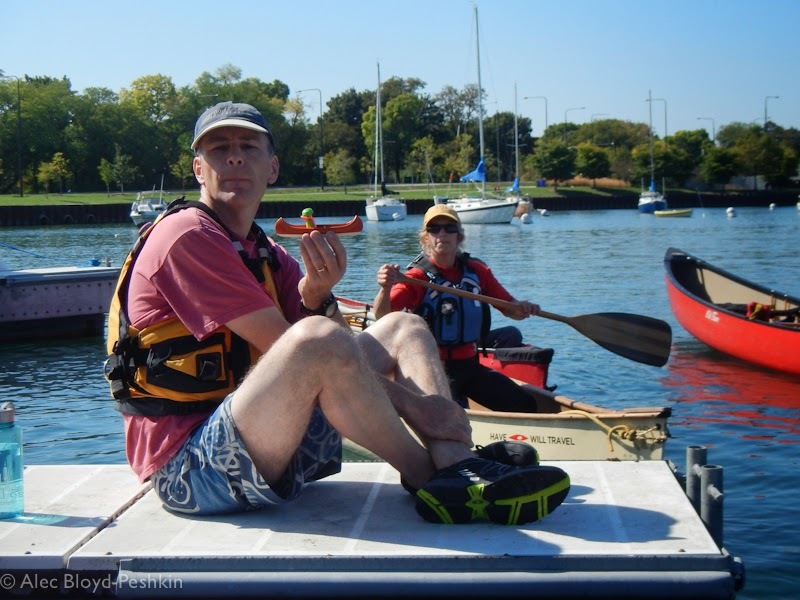 Woollven shares what he carries in his "ouch pouch" and first-aid kit, and demonstrates a few first aid techniques, but emphasizes that each paddler should carry what's appropriate to his or her training and needs. If you're expecting a video first-aid course, this isn't it. Rather, he makes a compelling case for taking a wilderness first aid course. The last section of this video is the weakest. "Rolling Clinic" involves Gordon Brown working with a group of students at a swimming pool. It's clearly not staged; these are real students with little or no rolling experience. What made us cringe was watching them repeat errors without correction, reinforcing bad habits that become increasingly difficult to break. After all, it was in Gordon Brown's book, Sea Kayak: A Manual for Intermediate and Advanced Sea Kayakers, that we first encountered the idea of 10,000 hours of deliberate practice to learn to do something well. Producer/Director Simon Willis of Sunart Media has clearly put in his 10,000 hours. Volume 3 employs many of the innovative filming devices he created for earlier volumes; the multiple camera angles he uses in the rescues section are effective and unobtrusive, and the viewers' attention stays on the action, not on the filming that captured it. 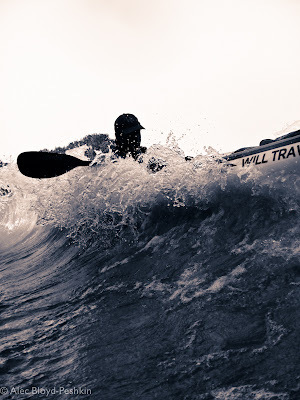 Volume 3, Sea Kayak with Gordon Brown v2 from Simon Willis on Vimeo. Holiday weekend ahead. 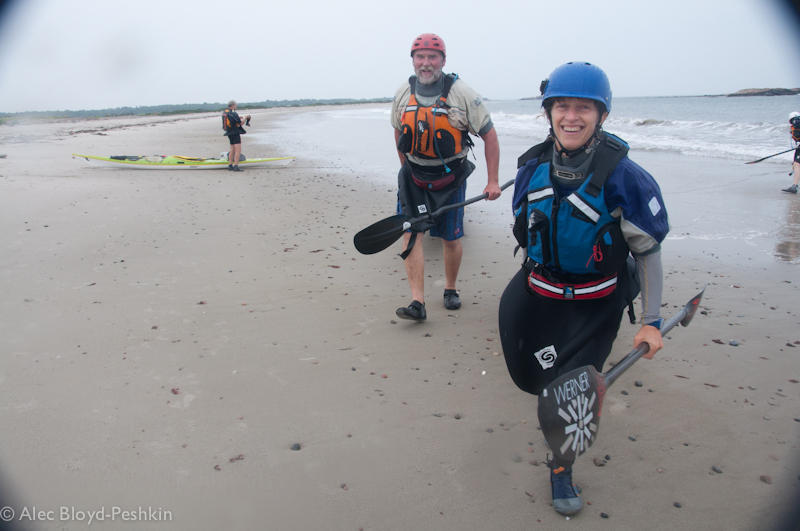 What's your paddling plan? 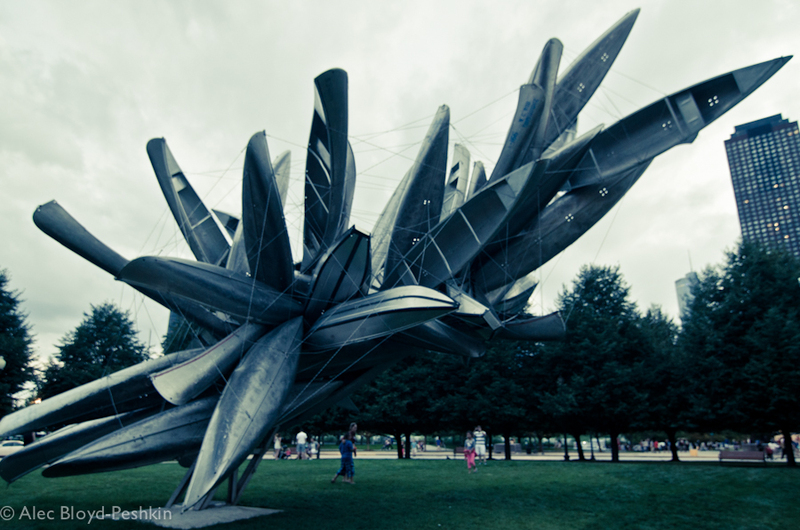 Canoes as public sculpture by Nancy Rubins at Navy Pier. Tom Motte, our Rhode Island connection. 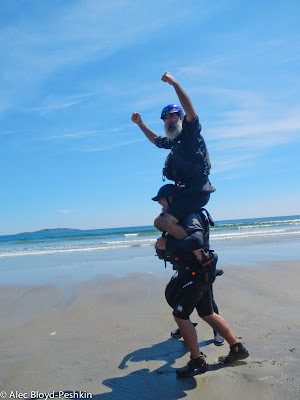 While we were in Maine, we briefly met Tim Motte, who tossed out a casual invitation: "Come to Rhode Island!" 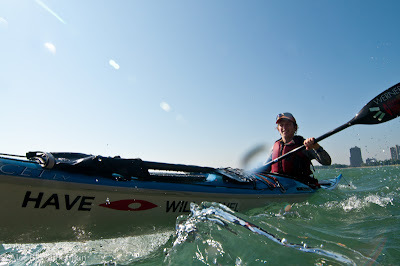 As with many invitations of this type in the paddling world, much more is implied. 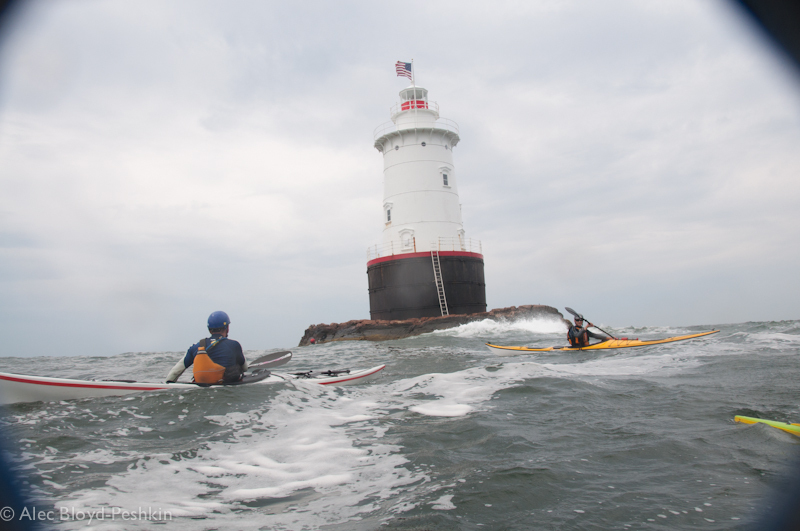 The full invitation is, "Come to Rhode Island and I'll take you on some amazing paddles and introduce you to my kayaking cohort." And in this case, "You can stay and my house and I'll make you lunch!" Today's menu: Peanut butter, banana, pumpkin seed and raisin sandwiches. So, of course, we went to Rhode Island, where we got to know Tim and the Rhode Island Canoe/Kayak Association (RICKA) crew. has entered a higher level of performance, involving a high level of personal skill and leadership in advanced situations. It is a leadership award and the appropriate test for paddlers who wish to lead groups of other paddlers in appropriate locations in advanced tidal waters and dynamic weather conditions typified by the Climate of the British Isles. The five star leader has the skills and judgement to select appropriate trips for a range of ability levels. 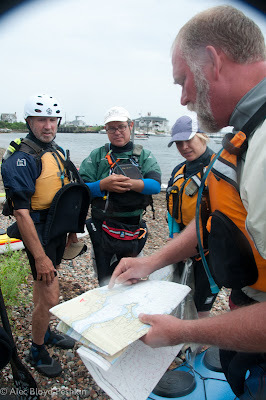 Tim points out the intended route on a chart. 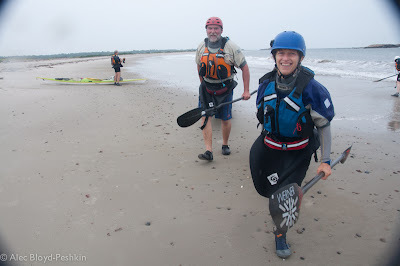 We were privileged to spend two days paddling on the Rhode Island coast with Tim and the RICKA paddlers. 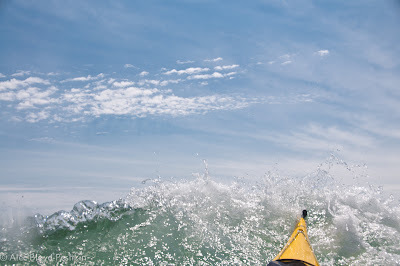 Rhode Island has only 40 miles of shoreline if you look at its general coastline, but it has 384 miles of tidal coastline, which includes coast, islands, bays, sounds and rivers 100 feet or wider. 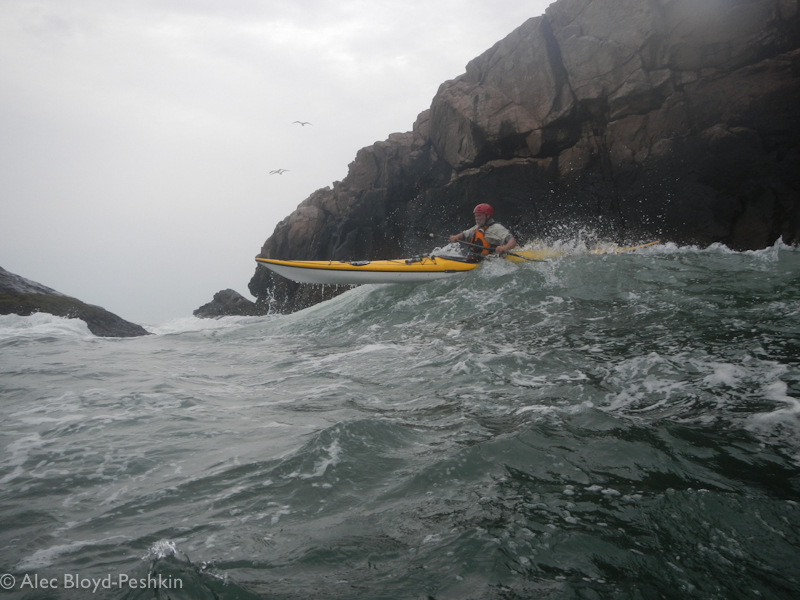 In other words, it's a craggy place, perfect for rock gardening and rough-water paddling. It was great watching Tim lead a group in these waters. In keeping with his five-star award, he adjusted the trip for participants who had varying degrees of comfort in the conditions. 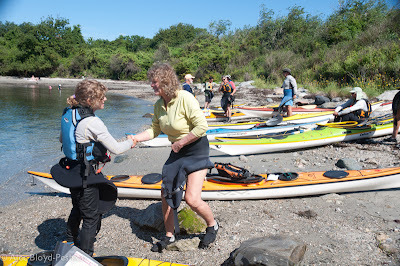 It was also great to meet more than a dozen RICKA paddlers from Rhode Island, Connecticut and Massachusetts, who realize how fortunate they are to live so near this amazing kayaking environment. Kayaking brings a diverse range of people together, creating strong bonds between people who otherwise would never have crossed paths. When we meet kayakers from other parts of the country and the world, we recognize in them the same passion for paddling, delight in sharing it, and desire to protect the places where it's possible. Thanks, Tim and RICKA. We'll be back. 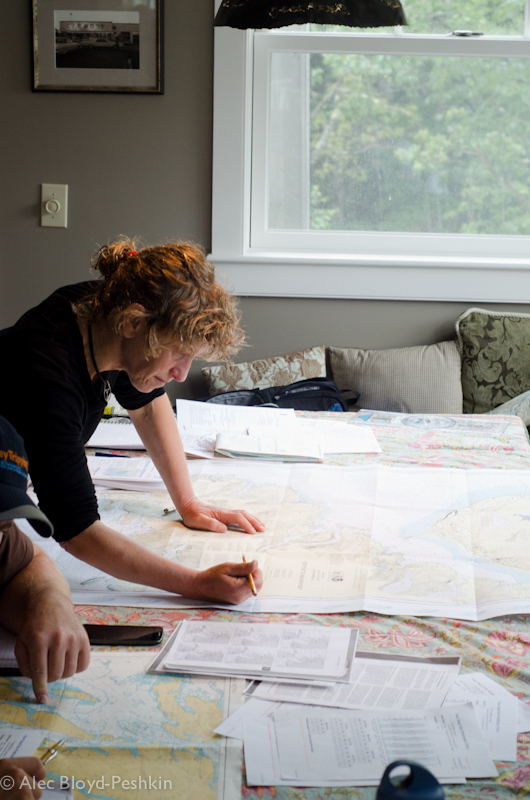 Planning a coastal journey during the four-star training. 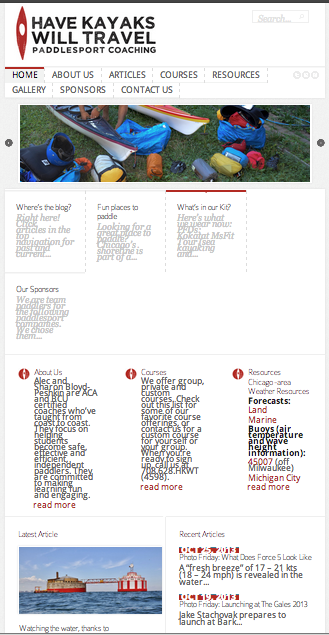 First, a disclaimer: We can't possibly summarize everything we learned in this post. But we can hit the highlights and explain why this training matters. And, in addition to all this, assess the skills of participants, make use of their assets on a journey, and offer helpful hints and timely tips to maximize their enjoyment and accomplishments. Safely landing a group on a ledge during the four-star training. We found that the skills we developed in the Great Lakes--paddling in rough water and current, executing efficient rescues, and assessing risks--transferred well and enabled us to be comfortable in the environment. We knew we would need to concentrate on navigation and tidal planning, and this proved true. 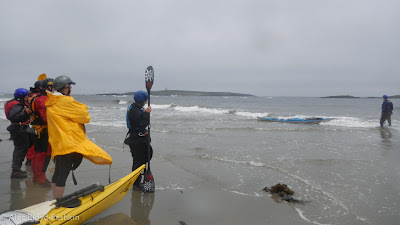 And we discovered that we need our navigation skills to be as comfortable for us as our paddling skills in order to fully concentrate on leading groups in a tidal environment. This is definitely where we need to do the most work. 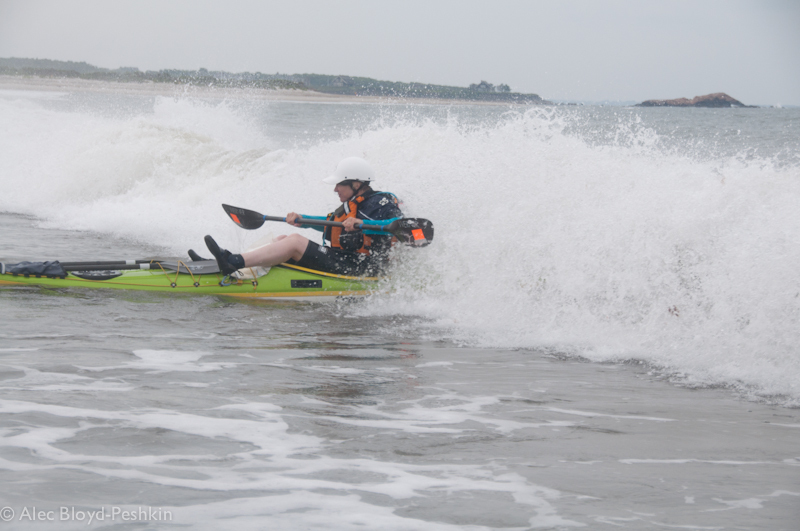 Working on surf landings with an injured paddler. An element that intrigued us was figuring how much control to exert in a given environment. This is tricky because it involves staying within the remit of the 4 star award, understanding the environment and conditions, and knowing whether you can fix any problems that arise. And it must be done not in the context of coaching (which is what we do most of the time) but while on a journey with friends, with a club or with paying clients. This means they ought to be able to explore and engage with the environment on their own terms as well as on ours. Watching as John demonstrates how boats behave in surf without paddlers. 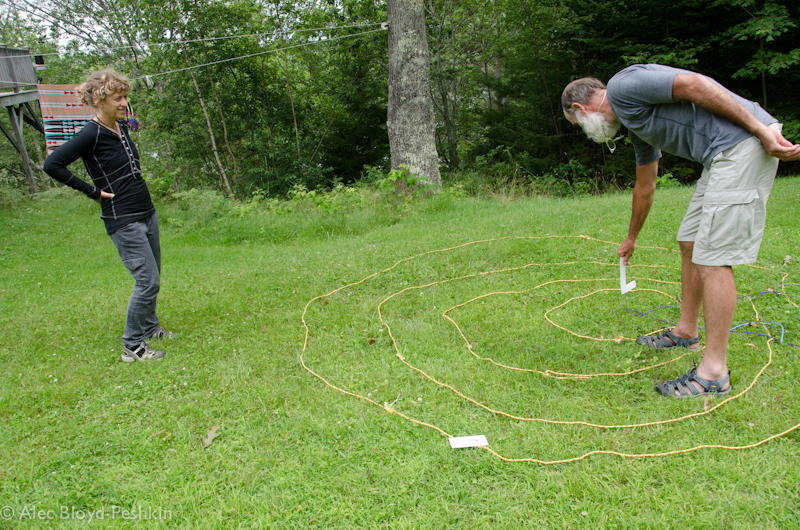 John creates a low pressure system in his back yard. This four-star training included all the elements we wanted and some we hadn't expected. We acquired a better understanding of and respect for the remit. We got a taste of a new environment and how it can be used. 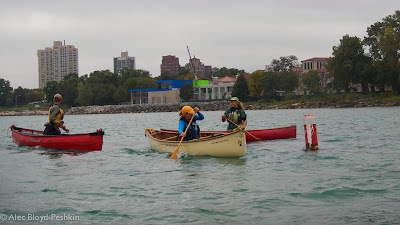 We came away with things we need to work on, and ideas for activities that will enable our Great Lakes students to be successful when they paddle in tidal environments. The goal of all this? To safely lead a group, even in fog. This we believe: becoming certified is more of a commencement than a conclusion of coach education. We gained our first certifications five or six years ago, but that was just the beginning of our journey toward becoming capable coaches. And we're still progressing along that path. This process is time-consuming, expensive and often humbling. But it's also engaging, exciting and eminently rewarding. Over the past few years, we've had the privilege of working extensively with Shawna Franklin and Leon Somme of Body Boat Blade, International on Orcas Island, Washington, and Scott Fairty of Summit Sports in Brighton, Michigan. Last month, we spent five days in Chicago working with Nick Cunliffe of Kayak Essentials in Anglesey, North Wales. 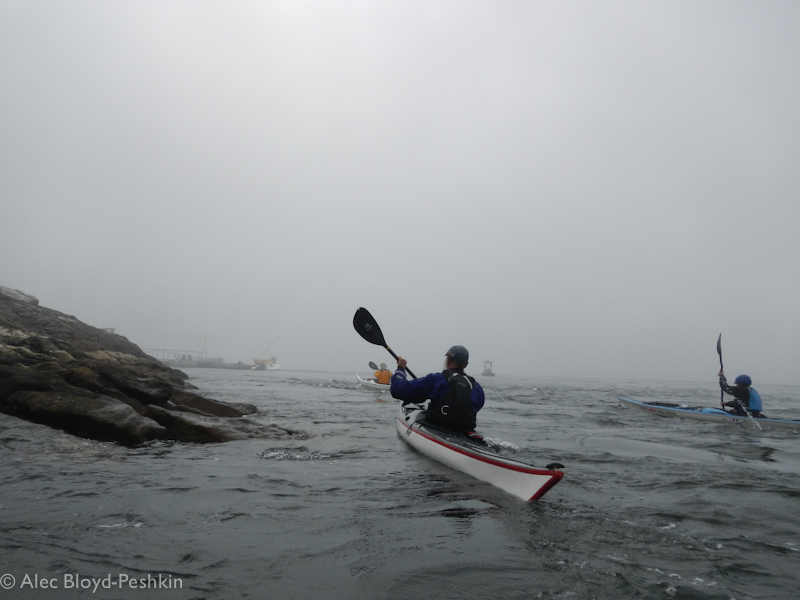 And we just returned from eight days with John Carmody of Sea Cliff Kayakers in Boothbay, Maine. We chose to work with John for both his reputation and his location. He's a BCU Level 5 Sea Coach -- the highest coach certification in the BCU system -- who combines a deep knowledge of seamanship and human biomechanics with paddlesport and coach education. And he's based on the craggy Maine coast, where an understanding of tides and current, weather and navigation are non-negotiable and provide good preparation for paddling in the UK (home waters of the BCU) and other ocean environments. A lighthearted moment on the beach. 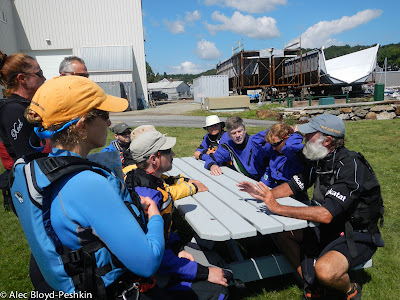 We signed up for a BCU four-star leader training with John, but he also invited us to observe a private lesson and a three-star assessment, as well as observe/assist with a three-day course for a group of eight students and their coach, Sylvain Bedard, from Quebec. This gave us seven days on the water with John, along with two days of navigation training on land--experiences that expanded our understanding of the ocean and his approach to coaching in ocean conditions. A conversation before a daylong journey along the Maine coast. Because we recently completed a BCU Level 2 coach training, we appreciated the opportunity to see the principles we've been thinking about put into practice by someone who makes it seem effortless. Like any good coach, John chooses a progression based on the students' goals and skills, and selects a venue to match. 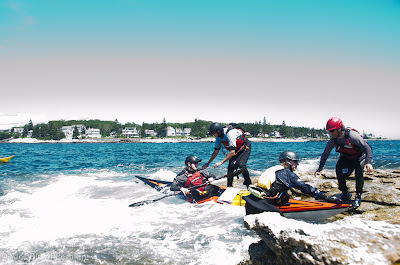 The Maine coastline offers plenty of opportunities to work in current, tides, swell and surf, as well as chances to maneuver around, over and between rocks and ledges. 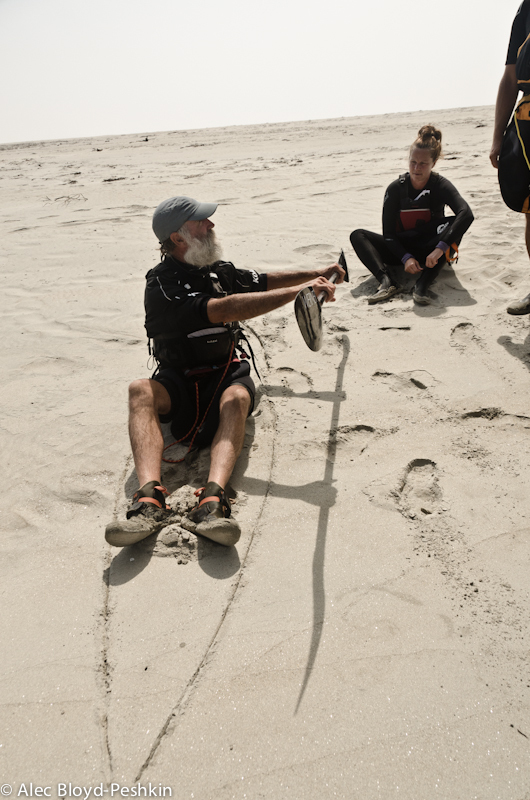 John demonstrates proper paddle position while ruddering in a boat made of sand. John has travelled the world, but there's one place he's never paddled: the Great Lakes. We're thrilled that he'll be a featured coach at the upcoming Gales Storm Gathering symposium, October 11 through 13 in the Apostle Islands. Registration is limited to 60 participants, but there are still some spots available. 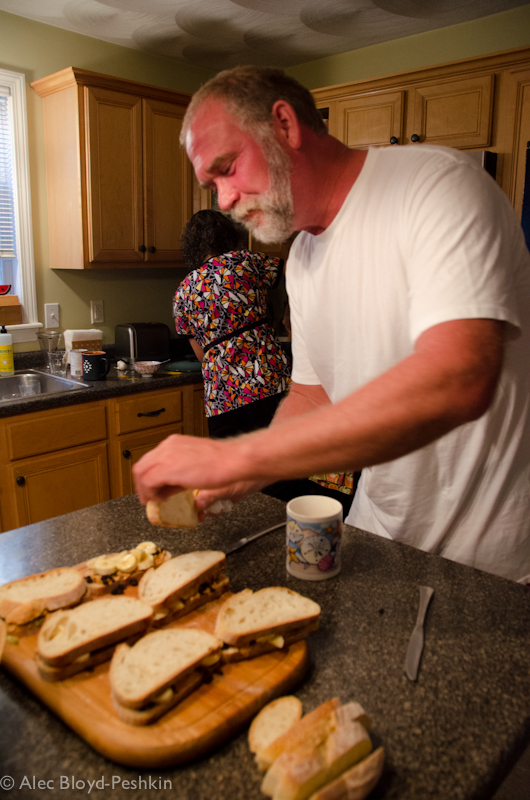 Register today and you'll be able to work with John, too, without the trip to the east coast. It's not unusual to find John coaching from the beach or standing in the water.